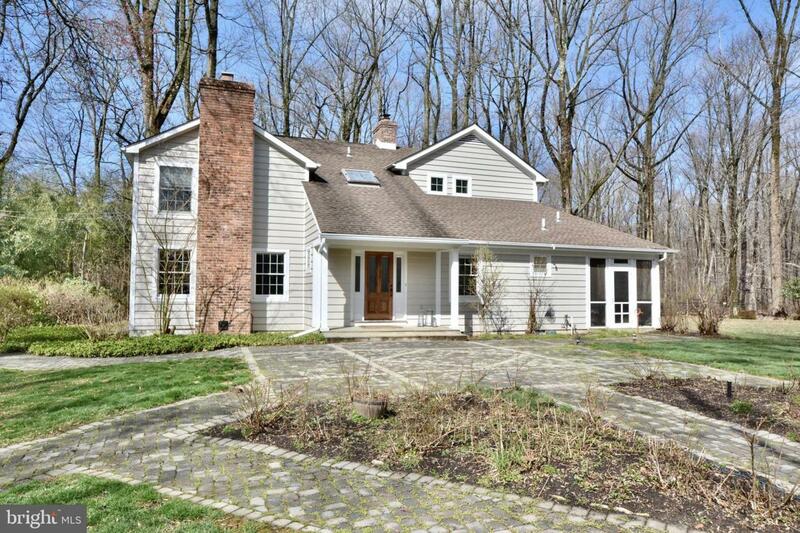 Located in Princeton's Littlebrook school district and at the end of a long driveway awaits this fabulous property situated on a rare 3.2acres of private grounds. This two-story colonial with gracious size rooms greets you at the stone covered front porch, which opens into a wide two-story entrance foyer. A front to back living room with a fireplace has been smartly combined with the dining room at the opposite end where formal dining and relaxing afterwards in front of the fireplace can take place all in the same room. 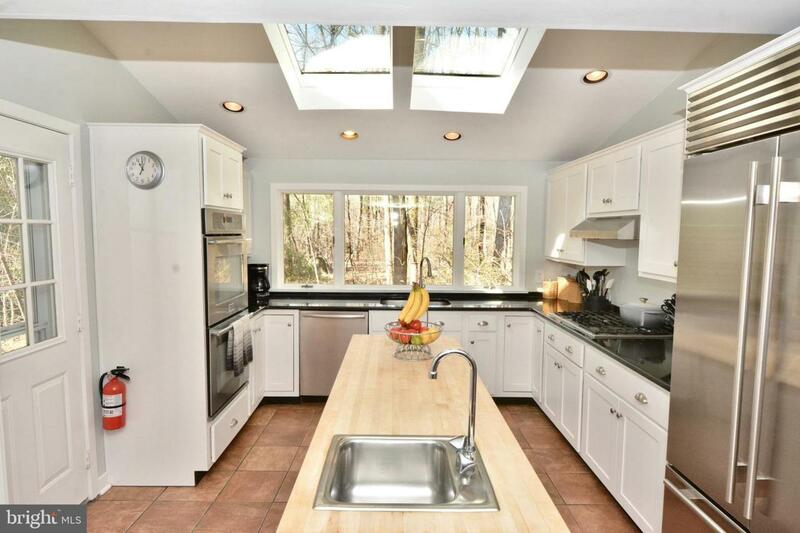 An updated, eat-in kitchen offers a center island with a butcher block top and vegetable sink that is surrounded by stainless steel appliances, white cabinets, granite counters and a huge picture window overlooking the yard at the farm sink with two large skylights above and a side door to the outside making this a sunny kitchen. 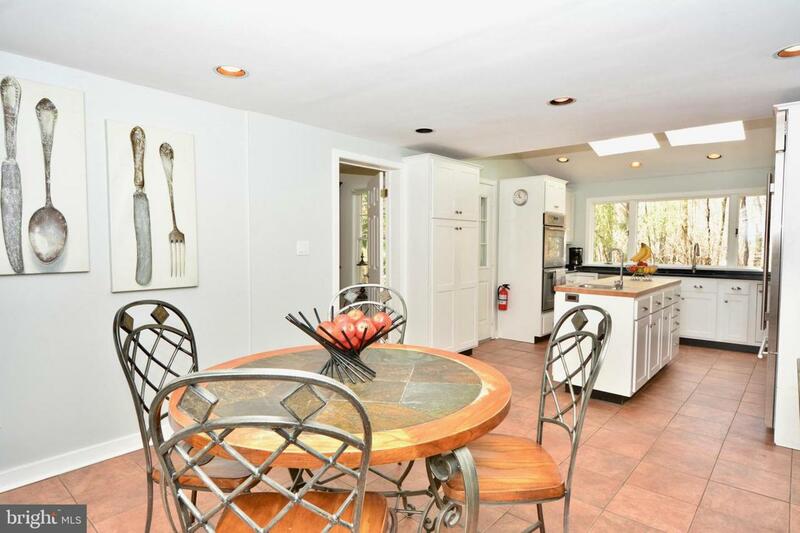 The breakfast area has room for any size table and behind the louver doors are the washer and dryer. Just off the kitchen is a sunken family room with a second fireplace that has cozy feel with floor-to-ceiling book cases on one wall and built-ins with glass front cabinets to house collectables on either side of the fireplace, glass French doors open to a gorgeous screened porch with pretty lawn and wooded views complete with a ceiling fan to keep the summer breeze moving. A study with hardwood floors (could serve as a 5th bedroom) is just off the family room with French doors that opens to a side patio. Just off the foyer is a full bathroom that would service the use of the study as a 5th bedroom. Upstairs is a grand master suite with vaulted ceiling, dual walk-in closets with windows, an updated master bath with skylight, soaking tub, shower and fantastic views of the grounds that will delight you with the change of seasons. Three more bedrooms and a hall bath are on the opposite side of the home. 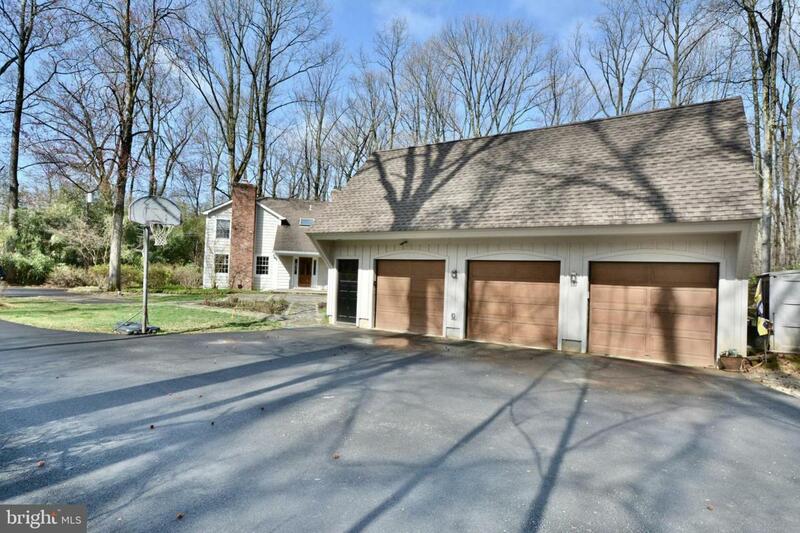 A three-car detached garage is oversized for car enthusiasts and a side door leads up to a fabulous studio space with a vaulted ceiling that is perfect for artists, writers, yogis, in-home office use, gym or hobbyists. The room is well lit with a full wall of windows and a built ~in desk area with plenty of room for fun and games! Minutes to town, schools, shopping, theater, the University and more, once a former schoolhouse with expansive renovation and additions this is clearly a special place to call home. Seller will pay NJ Mansion Tax for acceptable offer.